Miles Halter leaves Florida to go to a boarding school in Alabama in search of "a Great Perhaps". Once there, he's in for that and more. He's ironically nicknamed "Pudge" by his roommate "The Colonel". He falls in with a group of kids that includes Takumi (a Japanese rapper), Lara, and Alaska. Together they take on the "Weekday Warriors" (aka the rich local kids who go home on weekends) and "The Eagle" (the headmaster). Alaska in particular catches Pudge's heart, but she's an enigma. No one can figure out Alaska. She's hot one minute, cold the next. She's flirty, but has a boyfriend who she loves. Pudge can't help but worship her and be annoyed all at the same time. Then it's AFTER. Nothing will be the same as before. The search for the truth may or may not bring them answers, but it will never bring them what they had before. I mean, what can I really say about this book? I guess I can say that it's freaking GENIUS!! In so many damn ways. I'm actually starting to think that John Green is like Benjamin Franklin reincarnated because how can someone in today's world be so insightful? Hasn't everything already been thought and said and written about? Apparently not. John Green has ways of making stories that you've probably heard before seem new and fresh... and just completely smart. 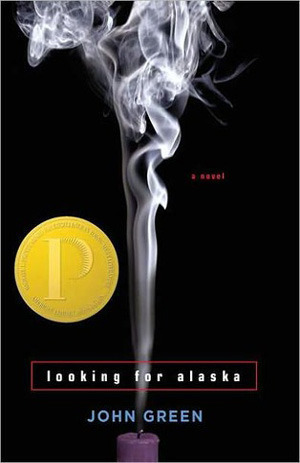 Looking for Alaska is not what I thought it was going to be about. I don't want to get all spoilery, but I didn't know it was going to have an event in it like it did. I thought it was just about a boarding school... so I was definitely a little stunned. I got over it. Miles is a great narrator and I really like reading books told in the male POV. It's like being on the inside of some secret world. Ok maybe not. But it's cool. The Colonel was a cool guy too and I loved the immediateness of their friendship. But Alaska... she was this book. She was so damn hard to figure out... from beginning to end. I didn't ever "get" this girl, but I don't think I was meant to. She is an enigma. She's a troubled girl with an impulsive personality... and no one truly understood her, but they all loved her anyhow. Miles and Alaska were always several layers away from anything. Physically and mentally. They were never on the same page, and I don't really know if Alaska kept it that way purposely or not. I love boarding school books, they remind me of the dorms. I miss the dorms... wait sharing a bathroom with an entire floor of girls and finding noodles in the sink when I'm trying to wash my hands?? No nevermind... but I miss the idea of the dorms and the closeness I had with everyone there. And of course, the pranks. And this book was full of awesome pranks. You just can't live with that many young people and NOT have pranks. My favorite part was definitely all the cool smart stuff that I could never come up with: The Great Perhaps, famous last words, the labyrinth of suffering, the crooked neighbors, and all that stuff. Just truly cool stuff. "Everything that comes together falls apart"
"She taught me everything I know about crawfish and kissing and pink wine and poetry. She made me different." Overall: Oh please read this book!! If you've ever read anything by John Green and haven't read this one, you need to! It's about more than you would ever think it could be about. I'm dying to get my hands on this book. I've read TFIOS and Paper Towns and this one looks even better than those! Great review.